Together with the road-going version of the Honda Civic Type R, Honda is also launching a special track use only version of the Civic Type R, developed together with Italy’s JAS Motorsport. 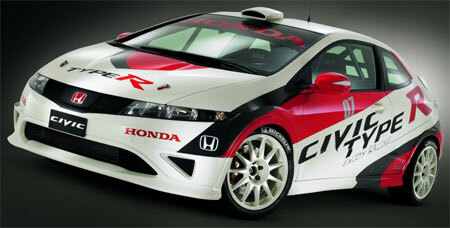 The JAS Motorsport Honda Civic Type R complies with the FIA’s GrN, GrA and GrR specifications and is expected to be available from Spring 2007. This special track Honda Civic Type R’s K20 powerplant produces over 200 horsepower updated with re-profiled camshafts as well as strengthened components like a reinforced driveshaft, and an advanced LSD with adjustable preload forces. Other components like suspension, springs, brakes and shocks have been replaced with race-grade components. The gearbox has gone from a 6-speed manual to a 6-speed sequential manual. Interior upgrades include a rollcage, a carbon fiber dash, door panels and floor panels.